Regions of human spinal cord. The names of the spinal cord regions depend on the name of the vertebrae that their nerves use to leave the spinal cord (modified from Puelles et al., 2008). Spinal cord is the caudal part of the central nervous system of vertebrates. It is covered and protected by the vertebral bones, and localizes in a long cavity known as medullary canal. In transverse view, spinal cord is rounded in most vertebrates, although it is dorso-ventrally flattened in some fish like cyclostomes. The shape is quite constant along the rostro-caudal extension, excepting the most caudal part where the diameter progressively decreases. In tetrapods animals, there are two thickenings located at the spinal cord segments that innervate the fore and hind limbs, respectively. Spinal nerves are numbered according to the vertebraes where their nerve roots are leaving the spinal cord. They also have a first capital letter in the name (C: cervical, T: thoracic, L: lumbar, S: sacral), followed by the number. Spinal cord contains an internal duct, known as central canal or ependimary canal, which runs along the spinal cord extension, has a small diameter, and is filled with cerebrospinal fluid. In some animals, like humans, the spinal cord does not reach the more caudal part of the medullary canal. In humans, the caudal part of the spinal cord ends at the level of the more rostral lumbar vertebrae. Some differences exist depending on the height of the individuals, so that the spinal cord ends at more rostral levels in taller individuals. It is because vertebrae grow proportionally larger than the spinal cord. In birds and reptiles, however, the spinal cord occupies all the rostro-caudal extension of the medullary canal. In the species where the spinal cord is shorter than the medullary canal, the part of the medullary canal without spinal cord contains the more caudal spinal nerves grouped in a bundle known as cauda equina (because it looks like a horse-tail). The filum terminale is a non-nervous structure that anchors the spinal cord to the sacral bone. Birds and reptiles lack both cauda equina and filum terminale. Spinal cord is isolated from vertebrae, as it happens to the encephalon and skull, by the meninges, which are layers or membranes that cover and protect the nervous tissue. 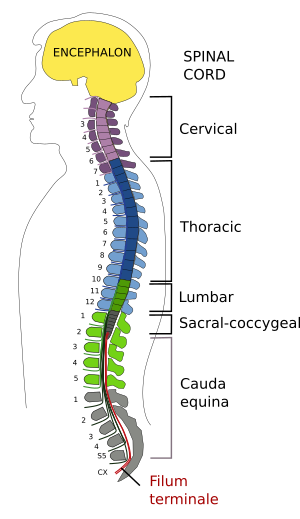 Main regions of the spinal cord. The axons of motoneurons, neurons that make synaptic contacts with muscle cells, and the axons of the neurons that send sensory information to the central nervous system, leave or enter the spinal cord, respectively, as bundles known as nerve roots. There are two types of nerve roots: ventral roots, which leave the spinal cord ventrally and carry motor information to muscle cells, and dorsal roots, which enter the spinal cord dorsally, and carry sensory information from most parts of the body. Furthermore, some axons from sympathetic preganglionar neurons (thoracic and lumbar levels: T1 to L3) or from parasympathetic neurons (sacral level: S2-S4), belonging to the autonomous nervous system, also travel through the ventral nerve roots. Both ventral and dorsal roots are distributed at more or less regular intervals along the spinal cord. They are sorted in couples, that is, two ventral roots and two dorsal roots are located at the same level of the spinal cord (one ventral root and one dorsal root, a couple, in each side; see figures). Each ventral root (motor) fuses with its dorsal root (sensory) within the same level and same side to form a mixed spinal nerve that extends through the body. The spinal cord that spans between two insertion points of rostro-caudally consecutive nerve roots is known as a segment, so that the spinal cord is rostro-caudally divided in consecutive spinal segments. In addition, in tetrapod animals, these segments are grouped in regions: cervical, thoracic, lumbar and sacral-coccygeal, depending on which is the vertebra where the nerve roots, of a particular spinal segment, leave or enter the spinal cord. In humans, there are 8 cervical nerves (C1 to C8), 12 thoracic nerves (T1 to T12), 5 lumbar nerves (L1 to L5), 5 sacral nerves (S1 to S5), and 1 coccygeal nerve. In transverse view, perpendicular to the rostrocaudal axis, spinal cord is constituted by two regions: gray matter and white matter. The names are because of the colors that these regions show in fresh tissue. The gray matter occupies a central position and it contains most of the spinal neuronal somata, whereas the white matter wraps the gray matter and mainly contains neuronal processes, mostly propriospinal axons (axons belonging to spinal neurons that do not leave the spinal cord), spino-encephalic axons (ascending to the encephaon), and encephalo-spinal axons (descending from the encephalon). The central canal or ependimary canal is located in the central area of the gray matter. On the left, main divisions of the spinal cord of a rat, transverse view. On the right, section of a rat spinal cord stained with haematoxylin-eosin. In most vertebrates, the gray matter in transverse view looks like a butterfly with spread wings. If the central canal is taken as the central part, the gray matter can be divided in a dorsal part and a ventral part. The dorsal expansions are known as dorsal horns and the ventral expansions as ventral horns. Neurons involved in the reception and processing of sensory information are located in the dorsal horns, whereas motoneurons are located in the ventral horns, that is, the effector motor component. In the central part there are mainly interneurons, although they are also found in dorsal and ventral horns. 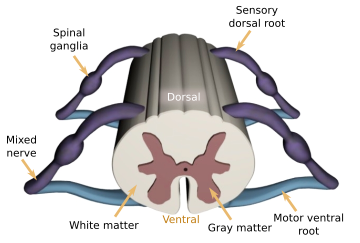 In mammals, the spinal cord is further divided in regions where specialized neuronal types are found involved in specific aspects of the sensory or motor processing. Different regions of the spinal cord. White matter is divided in bundles (called funiculi) of nervous fibers that run parallel to the rostrocaudal axis. Each funiculus is composed of axon fibers, most of them are myelinated. The different bundles are characterized by the type of information they carry along the spinal cord. Depending on the location of the neuronal soma of these axons, they are descending bundles, when the soma is located in the encephalon, ascending bundles, when the soma is located outside the encephalon and the axons reach the encephalon, or propriospinal, when both soma and axon are confined to the spinal cord and communicate different levels of the spinal cord. Each fiber tract is positioned in a specific place of the white matter. For instance, axon bundles coming from the cerebellum area are located laterally, axons from cortical areas are located more medio-laterally, axons tracts from the thalamus run through the medio-ventral area, and the ascending sensory information travels along axon bundles located dorsally.